Environmental advocates are pushing for a faster transition from diesel to electric buses in Pennsylvania. Filippini joined other environmental and public transportation advocates Thursday in Pittsburgh for the release of a report by PennEnvironment on pollution from diesel buses. 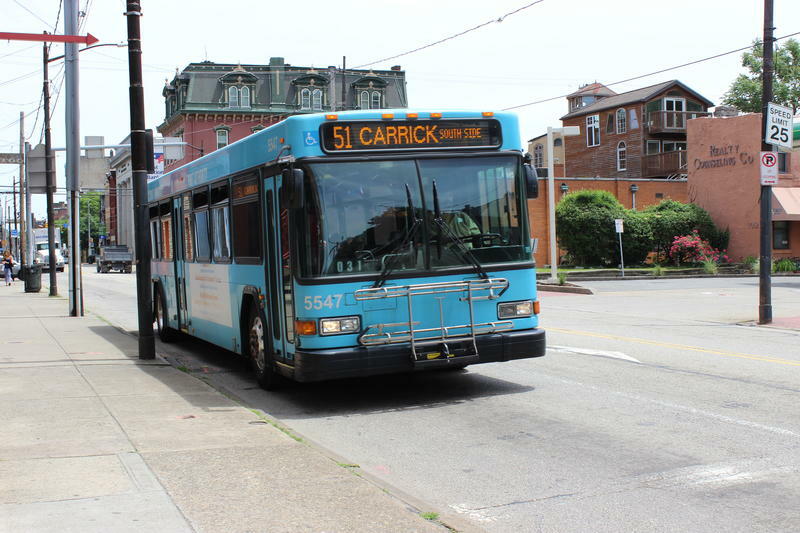 The Port Authority of Allegheny County has more than 700 buses in its transit system. “We think that by changing those to electric, we can have an air quality benefit equivalent to taking 4,464 cars off the road,” said Ashleigh Deemer, western Pennsylvania director for PennEnvironment. Transportation agencies are taking steps in that direction. The Southeastern Pennsylvania Transportation Authority is rolling out 25 electric buses in the Philadelphia region. Port Authority is planning to purchase two electric buses for the Pittsburgh area with the help of a $500,000 federal grant, spokesperson Adam Brandolph said. He said he expects those vehicles will hit the road in the fall of 2019 if the authority’s board approves them this summer. Cost, however, is a barrier. Brandolph said the electric buses that Port Authority is eyeing each come with a $1.1-million price tag. A new diesel bus costs less than half that amount. “If we can keep getting grants to offset the cost, we will continue to buy battery-electric buses, no question,” he said. The agency is planning to apply for the same federal grant again this year. It also intends to purchase some electric buses as part of its proposed Bus Rapid Transit system to improve transportation between downtown and the Oakland neighborhood. But Brandolph said other logistics complicate the switch. Electric buses can run 130-150 miles on a single charge. While that’s enough to cover many routes, he said some routes go on for 300 miles. The agency will also have to plan for particularly hot or cold days when the buses use more electricity to run the air conditioning or heat. Port Authority has brought in 32 hybrid buses the past few years. Pittsburgh Public Schools, likewise, is using cleaner diesel buses to transport kids to comply with federal emissions standards. Transportation director Eldridge Black said the school district would be open to the idea of electric buses down the road, but it does not have plans to make the switch. “It would be a huge undertaking for a district this big,” he said. The PennEnvironment report has several recommendations to pay for electric vehicles, including applying for federal and state grants, as well as leveraging Pennsylvania’s share of a settlement with Volkswagen, stemming from the car company’s diesel emissions scandal.